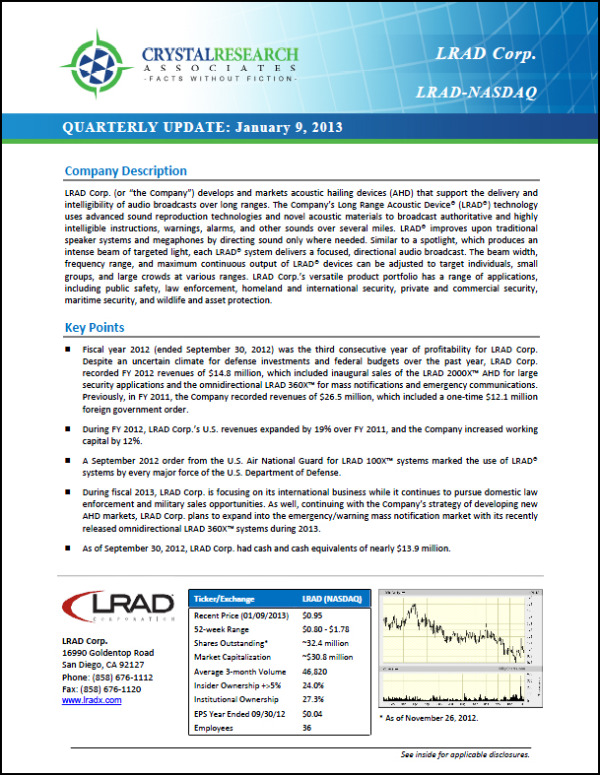 LRAD Corp. (or "the Company") develops and markets acoustic hailing devices (AHD) that support the delivery and intelligibility of audio broadcasts over long ranges. The Company's Long Range Acoustic Device® (LRAD®) technology uses advanced sound reproduction technologies and novel acoustic materials to broadcast authoritative and highly intelligible instructions, warnings, alarms, and other sounds over several miles. LRAD® improves upon traditional speaker systems and megaphones by directing sound only where needed. Similar to a spotlight, which produces an intense beam of targeted light, each LRAD® system delivers a focused, directional audio broadcast. The beam width, frequency range, and maximum continuous output of LRAD® devices can be adjusted to target individuals, small groups, and large crowds at various ranges. LRAD Corp.'s versatile product portfolio has a range of applications, including public safety, law enforcement, homeland and international security, private and commercial security, maritime security, and wildlife and asset protection. * The Corporate Snapshot was last updated on January 9, 2013.